You've been spotted by the baby unicorn! Shhh... you don't want to scare them off. 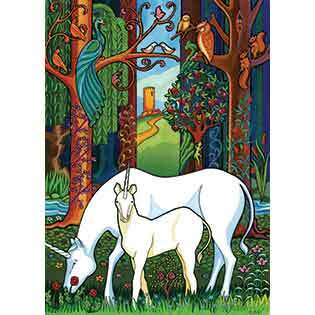 Sit back and enjoy watching them frolick in this enchanted Unicorn Forest that sets the scene for this 48 piece tray puzzle. Doesn't it look like mosaic glass art work? Simply beautiful! A tray puzzle is durable inlaid pieces in a tray with definitive outlines underneath for the child to follow when figuring out where each piece goes (see sample image). The shapes of the pieces and the colours are made to assist easy learning for young children. Recommended for ages 3+. Case Pack 24 mix/match Width 10"
Item # 58840 Weight 0.75 lbs.